Get out of town with these interesting Austin side-trips: San Antonio (Natural Bridge Caverns, The Alamo, & more), Fredericksburg (Wine Tours & Tastings & National Museum of the Pacific War) and Historic Williamson County Courthouse (in Georgetown). 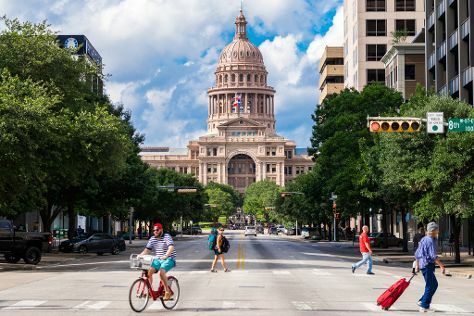 There's much more to do: ponder the world of politics at Texas State Capitol, explore the activities along Barton Springs Pool, look for gifts at Waterloo Records, and admire the striking features of The Driskill. To see maps, more things to do, traveler tips, and more tourist information, go to the Austin online visit planner . If you are flying in from South Korea, the closest major airports are Austin Bergstrom International Airport and San Antonio International Airport. November in Austin sees daily highs of 25°C and lows of 13°C at night. Finish your sightseeing early on the 2nd (Sun) to allow enough time to travel back home.